I’ve always been an emotional person. My sister makes fun of me for this sometimes, especially when we go to movies together. I wipe tears away and sniffle and she shoots me a glare, judging me because I’m crying at a Disney movie or the end of The Fault in Our Stars. She’s not an extremely emotional person unless she’s angry and that’s okay. But it’s important that she knows – and that everyone else knows as well – that emotions aren’t a sign of weakness. In fact, quite the opposite is true: emotions are a sign that you are a living, breathing, human being who experiences and responds to pain and circumstances. Jessica Pearson is not an emotional person. This has never been more evident than in the most recent Suits episode titled “Gone.” Mike and Harvey even joke about their inability to imagine Jessica holding hands with her beau or being overtly affectionate. Jessica is a strong woman, but she’s also a stoic and rather unemotional one. If a job needs to be done and it’s difficult, Jessica is the person to approach. She is bold and unabashed and that’s why she is the boss. I’ll admit – I find people like Jessica to be abrasive and difficult to get along with in real life. As an extremely emotional human being, I would balk at Jessica’s statement to Louis that his emotions made him weak. The fact of the matter is that everyone at Pearson Specter is a human being wired with emotions, thoughts, and feelings but everyone expresses these differently. Louis Litt and Rachel Zane tend to fall toward the “emotional” end of the spectrum with Donna and Mike trailing behind them. Harvey would fall slightly behind that duo and then there’s Jessica at the complete opposite end. Emotions aren’t bad and I don’t think that “Gone” insinuates that they ARE. I think that the characters in the series may have presumed Louis to be weak, to be a liability because of his desperate desire to please Jessica and Harvey and to earn their favor and recognition. And while I will admit to not always being the biggest supporter of Louis Litt, season four has actually allowed me to understand more fully his character, his desperation, his passion, and his heart for the people around him. There’s something truly universal about wanting to feel accepted and beloved. There’s nothing inherently wrong with wanting those things. The problem for Louis, of course, is that he’s often blinded by his desire to be accepted that he gets himself and others into trouble. But before I discuss Louis more in-depth and before I talk about how the end of “Gone” made me sniff back tears, let’s talk about the other characters, shall we? I’ll kick off my discussion of “Gone” with my least favorite romantic pairing including my least favorite character (sorry all you shippers and Rachel Zane fans). There wasn’t a lot of screen time for these two this week, but it was slightly significant: Mike still doesn’t trust Rachel. Are you surprised? Yes, friends, even though Rachel bought him six burritos and even though she bustles around the apartment like a maid, ready to do anything and everything Mike wants her to do, he still is grappling with the fact that she cheated on him. And Rachel – naïve little woman that she is – doesn’t seem to understand WHY Mike can’t just forgive her and move on already. I wish I could sit Rachel Zane down and explain to her that forgiveness isn’t a light switch: you cannot turn off forgiveness and then immediately turn it back on. Forgiveness is like a garden hose: sometimes it trickles out slowly, sometimes there are bursts of it, and sometimes it just shuts off completely. I’ve heard it said before that you often have to make the conscious decision to forgive someone who has wronged you. Every time you remember their actions or infidelity, you must stop and forgive them again. It’s a process that takes time and effort. But what annoys me so much about Rachel is that she seems so impatient and unwilling to wait for that forgiveness to be administered to her. She wants to earn her forgiveness – she wants to do anything that is required except the ONE thing that is: wait. What Rachel doesn’t seem to understand is what Mike explains to her in the episode. Forgiveness means you may still have sleepless nights. It may mean that you have outbursts and get angry. It’s something that takes time and no amount of pampering can undo the damage that was done. By the end of the episode, of course, Mike and Rachel have made amends and continue to try to work on their relationship, but I’m quite miffed at Ms. Zane for her air of petulance during the first half of this season. She hasn’t taken anyone’s advice (and all of the advice has been GOOD) and it’s only causing me as an audience member and all of the other characters in the series to grow frustrated with her. I’ll be honest: at this point, Mike deserves better. Donna wasn’t in “Gone” that much, but when she was, she was being bold and decisive. I often say that Donna is a queen and that she’s my favorite character on the series because she isn’t afraid to put others in their place when necessary. It takes a bold character to do that, but it takes an even bolder one to stand up to her very strong and strong-willed boss, Jessica. Donna stands up to everyone else at the firm – she’s unafraid to call out Harvey on his behavior (like she does at the beginning of the episode) or Mike or Louis or Rachel – but rarely has to stand face-to-face with Jessica. These are two extremely intelligent and proud women, able to command the attention of others… but when Donna confronts Jessica in the bathroom about her decision to fire Louis, things turn sour for our red-headed queen very quickly. Jessica refuses to back down from her decision and threatens Donna, reminding her who exactly it is that holds the ultimate power in their dynamic. It’s not often that we see Donna as the vanquished or the defeated within an argument but she is in this confrontation with Jessica. I truly do love Donna Paulsen, though, and here’s why: she cares deeply for the people around her and will try everything to rescue them when they need rescuing. Donna and Louis have forged an amazing friendship over the course of this season and it was painful to lie to him about being fired (technically, she gave him a half-truth) and painful to watch her lose an argument to Jessica about keeping Louis around even though he made a mistake (more on that in a moment). And what was especially painful but also really admirable was that when Harvey walked to Louis’ office to deliver the news of his firing, Donna demanded that she accompany him and Harvey didn’t deny her the opportunity. She was his friend and that kind of a message should only come from friends. Overall, “Gone” reminded us that Donna is fiercely loyal but that she’s also not heartless – she cares deeply and that care manifests itself in this episode quite clearly. I’m lumping everyone together as I discuss this week’s plot because the main story of “Gone” is that of trying to fix Louis’ mistake. Actually, let me backtrack a moment here: “Gone” is the story of trying to fix Louis’ CHOICE, per Jessica. Throughout the episode, a few individuals make note of the fact that Louis made a mistake but that everyone in the firm has, too: Donna has made her fair share, Mike has, and Harvey certainly has, and yet Jessica has managed to forgive them for their misdeeds. The question posed then is why can she not forgive Louis for his? Jessica’s reasoning here is pretty interesting. She labels Louis choosing to do business with Forseman and hide money from the takeover as a choice, not a mistake. The difference here is what Louis’ decision was rooted in. Mistakes, in Jessica’s mind, occur when someone is not thinking clearly. They occur frequently because someone had a momentary lapse in judgment. Louis’ decision was a conscious choice with conscious reasoning and was, therefore, not a mistake. He CHOSE to let his emotions get the better of him and he CHOSE to let his ego and pride drive him right to Forseman and he CHOSE to hide the documents that implicated him. Louis didn’t make a mistake – he made a choice. I was very much intrigued by this discussion, especially as it applies not just to the main story involving Louis’ actions, but also in the other stories. Did Jessica make a mistake or a choice when she lied to Jeff? Did Rachel make a mistake or a choice when she kissed Logan? How interesting do you think it is that Jessica presents us with these words that we often use interchangeably and yet never understand fully? Other characters in the series – and in lots of television series, to be honest – claim that their actions were “mistakes.” We’ve heard Rachel turn that phrase over and over again in the past few weeks, like a record that can’t stop skipping. She “made a mistake.” But… didn’t she make a CHOICE? And didn’t Donna affirm this when she noted that Rachel knew exactly what she was getting herself into when she consciously placed herself in Logan’s apartment? And if the words “mistake” and “choice” cannot be used interchangeably, as Jessica claims in this episode, then shouldn’t Rachel’s justification for her infidelity and Jessica’s dismissal of her own lies be aptly punished as well? I’ve often heard that we detest individuals who exemplify the negative qualities we possess because we don’t like being shown our own faults. I wonder if Jessica is so harsh on Louis throughout the episode not because he is “weakened” by emotions but because she decisively drafts a rule that even she herself cannot follow. 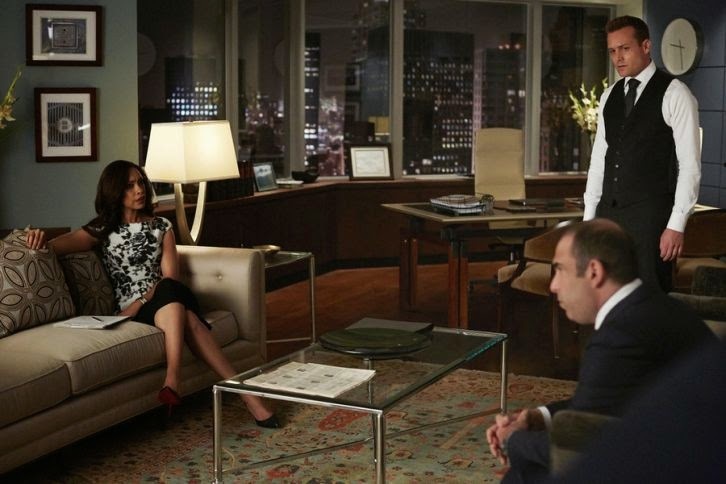 The team in Pearson Specter was just that, in “Gone”: they were a team. And together, the team worked in order to save themselves from the SEC and from Sean Cahill and Eric Woodall. They manage to do so by realizing that the reason Eric Woodall was so lax when Louis confessed to him about his illegal activity is because he’s in business with Forseman. And the only way for the firm to get Cahill off of them is to make him realize that his boss is working with the enemy. And that brings us to Louis. This week was an amazing display in just how far Louis Litt has come in terms of bravery and development. He made a mistake (or choice or whatever you’d like to call it) and is determined to help fix it. Jessica doesn’t want that, however, because it’ll draw attention to the firm and Cahill will sniff out their misdeeds like a bloodhound. She grows irate when he deliberately disobeys her and approaches the SEC anyway. But as fate or luck or deity would have it, Louis managed to save the firm by doing the very thing that Jessica told him not to do. In approaching the SEC, Louis realized that Woodall was working with Forseman and that they could manage to nail both of them AND get Sean Cahill on their side. He saved the firm and he saved the day. But that wasn’t enough, nor was the pleading by Donna and Mike and Harvey himself to Jessica for Louis’ salvation. She was determined to end his career at Pearson Specter because of his reckless and selfish behavior – because of his desire to be wanted and appreciated by those around him. I’ll be honest: I once thought of Louis Litt as somewhat of a Peter Pettigrew character. He was conniving and sneaky, ready to leap onto whichever team happened to offer him the best deal. But the more Louis Litt grew, the more I saw so much of myself in him – he’s a people-pleaser whose love language is probably “words of affirmation.” He needs to hear that he is valued and cared about, but Jessica is not that type of person. And Harvey isn’t that type of person. And all Louis wants is to please his bosses and his friends. They’re his family, after all, and family should support one another. The fault in Louis’ character is that he cares TOO much about what people think. He’s not especially confident in who he is as a person or a lawyer and that’s in part due to the cyclical relationship with Pearson Specter and his lack of appreciation (his lack of appreciation causes him to seek attention which causes him to make mistakes which causes him to dismay which causes him to seek attention, etc.) Louis is smart and weird and compassionate. He is thoughtful and all he’s ever wanted is for someone to think – just for a moment – about HIM. There comes a time when a man must look at himself in the mirror. To judge himself instead of waiting to be judged by others. And for me, that time is now … This is the only place I’ve ever worked. It’s the only place I’ve ever wanted to work. It is my life; it is my home. And the people that work here are my family. You’re like my parents, and the partners, they’re like my brothers, and the associates, under my care, are like my children. And I’m ashamed to admit it, but I put all of you in jeopardy for my own personal gain. I told myself it was for the greater good, but the truth is I just wanted to feel on the same level as both of you. I can deny that no longer. I can excuse my actions no longer. Although we’ve had our difference over the years, there are no two people I respect more. Your names are on the wall for a reason and mine is not for a reason. And I refuse to put either one of you through the pain of having to fire me. So effective immediately, I, Louis Litt, am resigning from Pearson Specter. Please take care of my home. If you didn’t tear up or at least feel a bit for Louis in that moment, you’re probably not human. This resignation letter wasn’t a sign of a cowardly, shrewd employee. No, it was the mark of a brave human being who refused to look at the situation as a negative. Louis left Pearson Specter with his head held high and he owned up to his actions. Furthermore, he continued – until his very last moment there – remembering nothing but joy and respect; he esteemed Harvey and Jessica just as he always had. They would and could never understand the reason for his actions, but in these final moments, he tries to get them to see WHY he admired them so much. This was such a beautiful and powerful way for Louis to exit. He left on his own terms, but more than that, he left for the same reason he confessed to the SEC: because of how much he loved, admired, and respected the people he worked with and refused to put his needs or wants before theirs. And what a note to go out on. MVP for this episode is clearly Rick Hoffman. I cannot articulate how brilliant and how wonderful his portrayal of Louis Litt has been. I’ve loved growing from hating him to genuinely feeling compassion and sympathy for him. Bravo, Rick.